It is morning time here in Rio and I am already on a press bus heading to the equestrian venue. This is the earliest that I have been up, and after two weeks of staying up to 3am, it was a tough one getting up this morning. But all good...more time to write this blog post. And this is a post I have wanted to write for at least a week. Today I want to talk about my lens choices. When I have had time, I have posted the settings for some of my photos, and many of you have written back asking about the different lens choices, mostly about the Canon 200-400mm lens. So this blog post will hopefully give you some insight into what goes on in my little brain before each day. Each morning I try to plan out my day of shooting. This mostly involves determining which sporting events I think I will attend, and then looking at the shooting positions for those venues. Using today as an example, I know for sure that I will be going to Equestrian Jumping (heading there now - so I hope we get there), then possibly a little bit of synchronized swimming and then water polo later in the afternoon. Having photographed equestrian jumping in London, and looking at the media guide for Rio, I am expecting the shooting positions to be all around perimeter of the venue. And in London I remember that the shooting positions were on dirt, so a rolling bag is not ideal. For this reason I have moved my gear into my ThinkTank backpack and taking that with me for the day. It is harder on the back, but more easily transportable. With this in mind, I have changed up my lens choices for the day. Today I am packing very light, with one Canon 1D X Mark II, a Canon 100-400mm lens, a Canon 24-70mm lens and a Canon 16-35mm lens. I have left the big 200-400mm lens back at the Main Press Center, but will pick it up this afternoon to use for the other two events. Should I have brought it with me to the equestrian event? Maybe, but to be honest, I am tired of lugging that beast around, and want a break this morning. And...I think that the 100-400mm lens (without the tele converter) will be fine. The venue should not be that big. I will let you know when I blog the equestrian shots. So....why those 3 lenses? I chose the 100-400mm lens because it is relatively small and has a very versatile focal range. It is also very sharp and should yield some nice photos. I brought the 24-70mm lens because I never want to be limited to 100mm as the widest focal length I can shoot. What happens if there is a jump only 10 feet from the shooting position? This lens will cover that. I brought the 16-35mm for the option to go even wider. I am not sure I will need it, but it isn't that big or heavy, so along it comes. As I mentioned, when returning from this morning's shoot, I will go back into the MPC and pick up the 200-400mm lens. This has been my go-to lens for this Olympic Games! I used a prototype of this bad boy in London and it was love at first site. * With the built-in tele converter, I can flip a switch and extend the range of the lens from 400mm to 560mm. This is invaluable! When I am shooting water polo, I flip this switch each time the play shifts from one end of the pool to the other. Honestly, I hate being limited to a fixed focal length lens, because, as I see it, there are too many times when the focal length of a fixed lens is either too little or too much. And if you have been looking at my images from this Olympics, you will notice that I zoom all the time. I can not imaging having to switch camera bodies, with different focal length lenses every minute or two. Ugh. This lens is the ultimate in versatility. One lens that covers from 200mm to 560mm. Yeah, it is expensive, but I can not imagine shooting the Olympics without it. * The lens is plenty sharp and focuses fast. Obviously, both of these are of utmost importance to me. * With the handle, this lens is surprisingly easy to haul around. Yes, it weighs 8 pounds and it draws a lot of attention from people who have never seen a big ole lens like this, but it is still not overbearing to carry around. I have hauled this lens with me everyday for that last 8 days, and my back is still fine. * This lens has a large metal lens hood for great protection from both the sun, and also if I were to drop this thing, it would provide a lot of protection to the front glass element. * It allows me to shoot all the way from f/4 to f/32 which is really awesome. This lets me shoot in low light with nice bokeh (f/4) and also roll to f/32 for those times when I am in a lot of light and want to have a slow shutter speed. People have asked me if I handhold this lens, and at times I have, but I almost always have this on my Gitzo monopod. You would not want to hold this large lens for an extended period of time. You would be hurting for sure! My Gitzo monopod is an absolute necessity here at the Olympics. So much so, that I brought a backup monopod just in case mine was lost or stolen. I just arrived at the equestrian venue and saw this guy walking around. This is what I want to avoid at all costs!!! I would prefer to have one versatile lens, then break my back like this! I hope this was helpful to all of you out there. 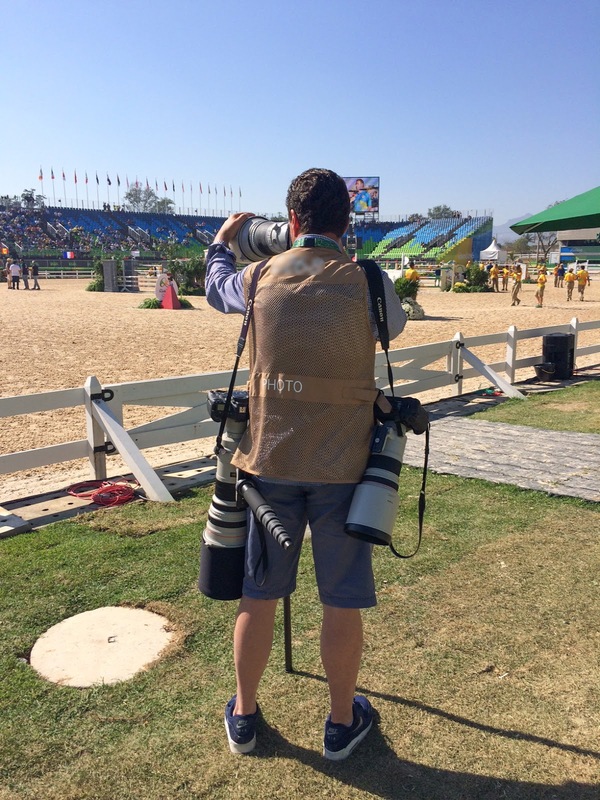 Time to go photograph some horse jumping!